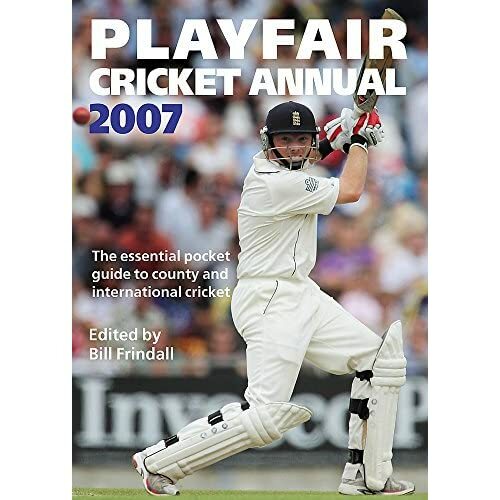 Always interesting to see who appears on the front cover of the Playfair Cricket Annual. It’s a bit of a poisoned chalice, based upon a player’s form in the previous season. As such, they usually fail spectacularly in the next summer. This year’s victim is Ian Bell. Expect one or all of the following: loss of form; chronic and/or career-threatening injury days before the opening Test; other chronic things; tabloid exposure (unlikely in this case) and/or does/has a Thorpe; dropped in place of Mark Butcher; dropped in place of Ashley Giles who is promoted to No.3 as reverse-pinch-hitter. Or, worst of all, he launches a book in an attempt to dethrone Jamie Oliver, entitled Cooking like the Shermanator. It fails – he fails – and Frindall starts plotting the downfall of 2008′s incumbent. Pre-order it now for a puny Â£3.99 (released April 5 2007). This entry was posted in Cricket and tagged playfair. Bookmark the permalink.